Double strength Lyprinol® may provide relief of osteoarthritic pain. Blackmores Lyprinol® Double contains a unique green lipped mussel oil that may provide symptomatic relief of osteoarthritis. 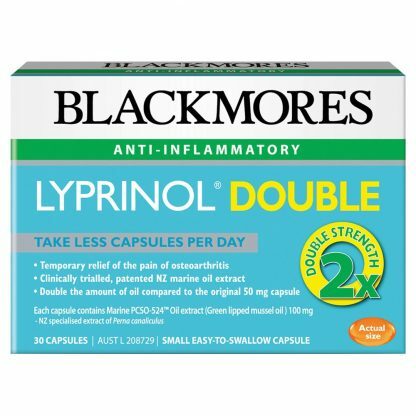 Lyprinol® Double is exclusive to Blackmores and may provide symptomatic relief of osteoarthritis. Adults – The recommended starting dose is 1 capsule twice a day with meals in the morning and evening, for up to 8 weeks. After the initial 8 weeks take 1 capsule a day with a meal, or as professionally prescribed.